Russia is one of the countries famous for the beauty of its cities. Besides Moscow and St. Peterseburg, Nizhny Novgorod is a city that is also famous for its beauty. Lots of favorite tourist destinations in this city. You can find all types of destinations in this city. Especially if you are a lover of art, Russian history, or culinary, this city is a city that you must visit. This city will not be quiet especially when weekends come or national holidays. Among the famous destinations of the city are the Kremlin, Chkalov Staircase, Bolshaya Pokrovskaya Street, and Cable Car. The destination is always filled with local and foreign tourists. From morning to night these places are always crowded. Bolshaya Pokrovskaya Street is a tourist destination located in the heart of Nizhny Novgorod. Bolshaya Pokrovskaya Street is one of the oldest roads in the city. In the old imperial era, the road could only be passed by nobles. If you visit Bolshaya Pokrovskaya Street, you will find many street artists and typical Russian restaurants that have unique decorations. Why do we discuss Bolshaya Pokrovskaya Street? Because this place is the most crowded place at night. In accordance with the title of our article this time, “Let ‘s Take A Peek Into Nizhny Novgorod Nightlife“. The night atmosphere feels different. Many people prefer night to go to certain places to entertain themselves or with loved ones. The city center is a place that is always crowded at night, especially during weekends. Likewise with Russia, the beautiful city center is always crowded at night. The cities there really live at night. Like Moscow, St. Petersburg, and Nizhny Novgorod. Especially if you spend your night at Nizhny Novgorod, one of the most beautiful cities in Russia as well as a city that has become a UNESCO World Heritage because of its history. The night atmosphere at Nizhny Novgorod will be very entertaining and liven up your mood. this city really lives at night. Not only adults, when the weekend comes, many teenagers also hang out with their friends. lots of bars and karaoke spread in Nizhny Novgorod. If you want to spend your night in Nizhny Novgorod, there are several places that we recommend you visit. Let’s take a peek at Nizhny Novgorod’s nightlife clearly. Bolshaya pokrovskaya street is a street located in the heart of Nizhny Novgorod. This road is not an ordinary road. Lots of places that can be visited here. This place is also one of the places that must be visited by tourists when they visit Nizhny Novgorod. In the days of the Russian empire, this road could only be passed by the nobles. This is why this road is so extraordinary. Its luxurious decor has the nuances of the Russian empire. This road is always crowded with tourists and locals. And when night and midnight, this road is the most crowded place on Nizhny Novgorod. Maybe you ask, why is this place so crowded at night? The answer to your question is because there are lots of bars, restaurants and cafes open 24 hours a day. So that the nightlife in Nizhny Novgorod is very visible in this place. Restaurants in this place are very diverse. Starting from high-class, middle-class and ordinary restaurants. Most of these restaurants serve typical Russian food. however, some of their menus also adopt western foods such as Italy and America. Here are some places that we recommend you visit if you want to experience the sensation of nightlife in Nizhny Novgorod. If you want a luxurious and high-class dinner, you can have dinner at Vitalich Restaurant. This restaurant serves very tasty and typical food and drinks. The decoration of the place is also very unique and luxurious. If you are a literary lover, you can visit Berzhukov Restaurant. They often hold literary exhibitions in their restaurants as distinctive features. And the food in this restaurant is no less delicious with vitalich restaurant. If you want to enjoy the real nightlife, you can also visit the bars on this street. The most popular bar is Berezka Bar. This bar is located at 51A Bolshaya Pokrovskaya Street. This bar is open 24 hours and a full week. Cocktails and food at this bar are also famous for being delicious. Besides that they also provide food for those of you who are vegetarians. Enjoy delicious food while hearing DJs playing music, interesting right? Besides bars and restaurants, the cafe on this street is also very famous. Many teenagers spend their weekend time hanging out with friends at cafes around this street. The cafes at Bolshaya also offer live music and sometimes quite large concerts. of course, this is very interesting for music lovers and teenagers. This will be your most expensive night but also the most glamorous. 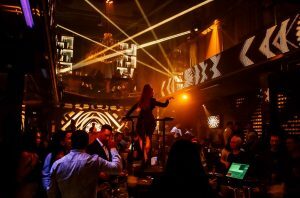 This club is a very popular luxury club on Nizhny Novgorod. The club is located in the Nizhnevolzhkaya Embankment 16. They are open only on Fridays and Saturdays starting at 11 PM until 6 AM. Regarding the price, if you are interested you have to pay 15 dollars per person for an ordinary class. And if you want to get more services and facilities, you can order VIPs by paying two to three times the entrance fee of the usual class price. You don’t need to worry, they offer facilities that are suitable for the price. Your food will be served at fancy tables, plates and glasses. Wine here is also very tasty and distinctive. You’re like attending a party while in this club. Invited DJs are usually well-known DJs. This place is perfect for relaxing with lovers and also your friends. The next place that we recommend is more simple and relaxed. Harat’s Pub is located on Ulitsa Varvarskaya 32. They are open every day from 12 PM to 2 AM. This pub is very famous with its various and delicious beers. Sash Cherry is one of the most popular menus for visitors. This bar is very crowded because of their flagship facilities. they provide game bars and musical performances. This place is perfect for hanging out with your friends. the decor is also very comfortable, with dark brown shades. This place is perfect for chatting and laughing with friends and you don’t want to go home. Feel that the night will not end. Such is the nightlife on Nizhny Novgorod. This city is one of the cities that is always crowded every day. You can visit one of the places we recommend spending your night. If you want to feel the real sensation of the night, Nizhny Novgorod is the right choice. You will not be disappointed. We hope our article “Let’s Take A Peek into Nizhny Novgorod nightlife” will make you even more interested in this city that is rich in art and history.